Sliced thinly into salads, kale stems add a flavour-packed crunch to the mix, while chard stems can be made into excellent pickles. They are also both equally delicious when sliced thinly and sautéed alongside their leaves. 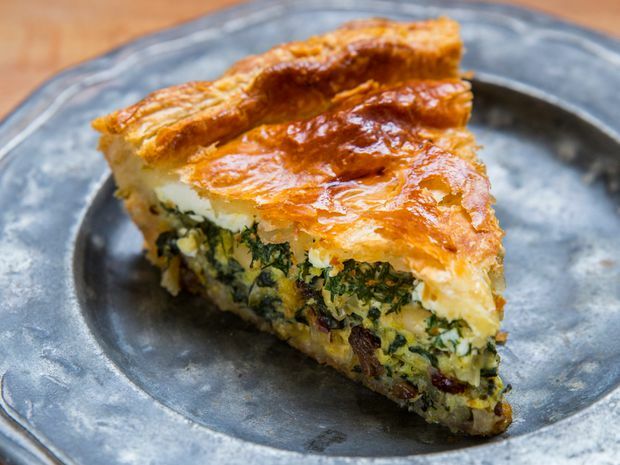 This recipe does exactly that, cooking the chard stems and leaves together with leeks and other aromatics to form the base of this easy-to-make tart. Leek and Swiss Chard Tart. When working with leeks, keep in mind that they can be a bit sandy between the layers. Cut away the dark green tops before slicing the lighter part of the leek in half lengthwise. Rinse each half under cold running water, peeling back the outermost layers to reveal and wash away any sandy bits that might be in there. Don’t forget to save those dark green leek tops in the freezer for a stock later. Consider giving them a quick rinse as well to make things easier for when you want to use them. Store bought puff pastry is a lifesaver. Perfect in a pinch, for when making your own pastry just isn’t in the cards, or your schedule is busy. Served alongside a fresh green salad, or even a nice cup of soup, this tart makes for a perfect light fall lunch. Great when eaten straight from the oven, it can also be served later at room temperature. It will also be perfect for lunch the following day, but being so tasty, I doubt there will be much left over. Heat the olive oil and butter in a frying pan over medium heat. Sweat the onion, leek, garlic and chard stems for 2-3 minutes. Add the chard leaves and raisins and season with salt and pepper. Continue to sweat for 10 minutes or until the onions are fully cooked. Any liquid released from the Swiss chard should be cooked off and you should hear a light sizzling sound. Adjust the seasoning as necessary. Spread onto a parchment-lined tray and allow to cool at room temperature for 10-15 minutes. Whisk the egg and water together in a bowl until smooth. Set aside. Carefully lay the first sheet of puff pastry down in the bottom of a greased pie dish. Layer with the cooled chard and leek mixture. Evenly sprinkle the surface with the pine nuts and the chopped dill. Dot the surface of the filling with ricotta and zest the lemon over top. Whisk the two eggs with the cream together in a small bowl and then drizzle across the filling. Finish with freshly cracked black pepper. Lay the second sheet of puff pastry across the top of the tart. Use kitchen scissors, or a knife, to trim the pastry as necessary along the edge of the pie dish. Pinch the bottom and top layers of pastry together along the edges and then brush the puff pastry lightly and gently with the egg wash.
Bake on the middle rack in the oven for 20-30 minutes or until the pastry is golden brown. Serve immediately or cool on a rack and serve at room temperature.